The Fae, (otherwise known as the Sidhe or the Gentry or the Little People or the Tuatha da Danaan), are also known as the faeries. Spirits of the Land, they are not to be confused with goddesses or angels. Two Seasons The first principle is the division of the sacred year. For the ancient Celts there were only two seasons; summer and winter, or the light half of the year and the dark half of the year. The dark half began at Samhain or as it is known in modern times “Halloween” or “All Souls Day” while the light half began at Beltaine or as it is known in modern times “May Day”. These two festivals were the holiest days of the Celtic year, acting as portals between dark and light, between one state of existence and another. They were times of chaos and change when Spirits were said to move freely between the worlds and communication with dead ancestors was most easily achieved. Three Worlds For the Celts there were three worlds that existed simultaneously and which were intertwined with each other to make up the whole of existence. The world of “Sea” or water was the underworld of the ancestors and the Sidhe or Fairies. This world was under the earth but could be accessed through water; hence offerings were dropped into water such as lakes, ponds, wells and streams, as gifts for the Fairy Realms and for the honored dead. 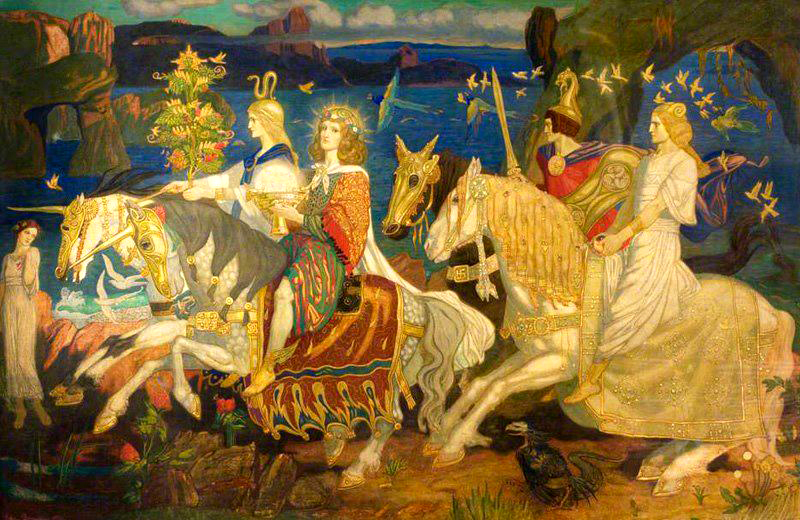 Four Treasures By tradition the Tuatha de Dannan or the Children of Danu, flew in from the north bringing their four treasures with them; the Sword of Nuada, the Cauldron of the Daghda, the Spear of Lugh and the Lia Fail or Stone of Destiny. Five Directions There were as many as twelve directions that were recognized as significant by the Celts, we know this because there were twelve winds or “Airts” that were recognized for their unique effects upon the land and the people . But for religious purposes there were five major directions that are still found in the myths and stories . The Tuatha De Danaan...[before settling in Ireland (from about 800 B.C. )]...were the...Black Sea princes of Scythia (now Ukrane). Like the original dynastic Pharaohs, they traced their descent from the great Pendragons of Mesopotamia; from them sprang the kingly lines of the Irish Bruithnigh and the Picts of Scotland’s Caledonia. In Wales they founded the Royal House of Gwynedd, while in Cornwall in the southwest of England, they were the sacred gentry known as Pict-Sidhe. dmund Spenser wrote that "the Chiefest [nation that settled in Ireland] I Suppose to be Scithians ... which firste inhabitinge and afterwarde stretchinge themselves forthe into the lande as theire numbers increased named it all of themselues Scuttenlande which more brieflye is Called Scuttlande or Scotlande" (A View of the Present State of Ireland, c. 1596). Among the proofs Spenser names for this origin are the alleged Irish customs of blood-drinking, nomadic lifestyle, the wearing of mantles and certain haircuts and "Cryes [or wailings] allsoe vsed amongeste the Irishe which savor greatlye of the Scythyan Barbarisme". William Camden, one of Spenser's main sources, comments on this myth of origin that "to derive descent from a Scythian stock, cannot be thought any waies dishonourable, seeing that the Scythians, as they are most ancient, so they have been the Conquerours of most Nations, themselves alwaies invincible, and never subject to the Empire of others" (Britannia, 1586 etc., Engl. transl. 1610). The German word for both Scottish and Scythian is "Scutten". The Celts been regarded as descended from Gomer, though history suggests modern Celts are descended from both Gomer and Magog. Archaeologists and ethnologists agree that the first Indo-European group to spread across Europe were Celts. The Irish Celts claim to be to the descendants of Magog, while the Welsh Celts claim to be to the descendants of Gomer. It was the Milsians who arrived from Spain (also known as the Scots after their mother, Scotia) who defeated the Dannans for rule of the isle, not the Firbolgs. From what we know archeologically, the earliest inhabitants of Ireland were probably a native folk who were possibly the ancestors of the Picts. Legend states that wave after wave of invaders came later. The legends state that Partholon and his people were there. They fought with the Fir Bolgs, or "bag men." Later came the Fomorians who were sort of like mutants or monsters, one eyed folk who were also sort of Mer-People. Then came the Dannans, or Children of the Goddes Danu, from around the Danube area. This is where their leader, Nuada lost his sword arm. The Sons of Mil had wandered all over the world as mercenaries. They were originally from Gaul and Celt Iberia. Mil took the daughter of the Pharoe, whose name was Scotia as his wife. Their descendants, were known as the Milsians or the Scots in their honor. The sons of the Mil, including Eber Don, and the great poet/Druid Amergin came to Ireland from Celt Iberia in what is now Spain and fought the Tuatha Da Dannans for it. They won. Thats why in Irish folklore there is sometimes a love-hate relationship between the Celts and their gods, the Dannans. When Ireland became Christianized following the fourth century the Dannans were no longer called gods, they were called Faeries or Good Folk, or The Others. They were typical pre-Indo European gods, for the most part. You had the Dagda or Eochid Ollithair as he was known - the good god. He was sort of like Thor-Biggest and strongest and he wielded a club so heavy six men could not lift it. You had Nuada the sword god with one arm, until a new one was fashioned from silver. He was sort of the Irish version of Tyr. You had Ogma, the bardic god who invented Ogham. He was sort of like the Irish version of Bragi, combined with Hercules. Then there was Lugh the spear god, who was sort of like Odin as a young stud. He fathered CuChullan, just like Odin begat the Volsung dynasty. Their goddesses were pretty similar too. Instead of having Valkyries the early Celts had war goddesses like Morrigan, Macha and Nemain. Thier goddess of love and beauty as well as smithcrafting was Brigid, who was later adopted as a catholic saint. Some Irish heroes may have been gods earlier, but when priests wrote the tails down got made into mortal heroes. Most of what we know of these myths we owe early priests who recorded the old tales on paper from the sixth to the 9th centuries. This information comes from Lebor Gabor Erin or the Book of Invasions of Ireland. The easiest place to find this lore is in Gods and Fighting Men by Lady Augusta Gregory. There is no Penguin Classics straight adaption. The stuff Mr. Middleton states about Greece is probably a reference to the stories in Britain about how one of the Trojan war heroes Brut came to Britain. Some archeologists belive that the Firbolg were Belgians and that the Dannans were actually Celts from the Danube. The earlier "invaders" such as the Partholonians, the Formorians and so on, could have been immigrants from Scythia and Finnland. DNA testing has shown that most folks in Ireland have similar DNA to folks in Basque Spain by the way. This seems to have put the kibosh on Simon James "Atlantic Celts" theory that the folks in the British Isles were always there and there were no invasions. Irish folk have similar DNA to Basques, and it is different from people in parts of England who have DNA that is similar to people in Germany. The story of the Miles Hispanceus going to Egypt and taking a wife is not so far fetched as it sounds. There have been many red haired mummies found in Egypt that could have been Celtic mercenaries. Supposedly the Celts picked up the dark haired trait from Scotia. The Goddess Danu or Anu as she is some times called was very popular in Ireland. There are two hills there called "The Paps of Anu" that are quite remarkable. You can still see them to this day from one of the various parks if you visit it. It is beleived the Danube river was named in her honor. Before the Germans came down out of Ultima Thule or whereever, the Celts lived in Germany. (According to legend, the Tuatha De Danann (Tribe of Danu / Danae) arrived at the Isles and fought with the Fomorians (beasts), eventually defeating them after three great battle eras. Some consider the Tuatha to be the first 'Celts' arriving from Europe.Then the Fir-bolg arrived from Greece and defeated the Tuatha (forcing them into another realm - hence elves\fairies).